From the funniest voice in young fiction today, our first ever Squishy picture book sees Ava and her invisible cat go to Buckingham Palace to visit the Queen. Pip Jones lives in East London with her partner, her two daughters and a real invisible cat. She writes a lot. 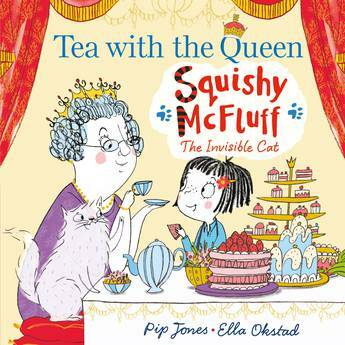 Pip won the inaugural Greenhouse Funny Prize in 2012 with Squishy McFluff: The Invisible Cat, her first book. She is the author of six other Squishy McFluff books, several picture books (including Daddy's Sandwich and The Chocolate Monster) and her new series Piggy Handsome. Ella Okstad returned to her native Norway after graduating where she now illustrates children's books. Squishy is her first imaginary cat. She also illustrated Ballerina Dreams.